FRANKFURT (Reuters) -- BMW today said it was looking into whether Google infringed any trademark rights after the Silicon Valley-based group set up a new company called Alphabet, which is also the name of a BMW subsidiary. "We are examining whether there are any implications over trademarks," a BMW spokeswoman said today. The spokeswoman said there were currently no plans to take legal steps against Google. 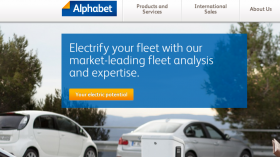 BMW's Alphabet, which provides services to companies with vehicle fleets, operates in 18 countries and supplies 530,000 vehicles to corporate customers. A legal dispute is unlikely since Google made clear in its announcement on Monday that in creating a parent company called Alphabet Inc., it was not intending to build products and brands under that name. Google has picked a name that is also a fairly common brand among American businesses. There are currently 103 trademark registrations in the United States that include the word "alphabet" or some close variation, according to a database search of the U.S. Patent and Trademark Office.